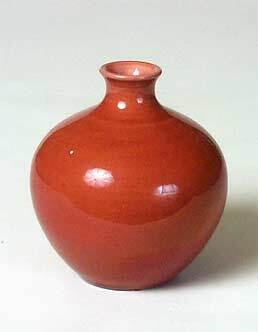 Bretby bottle - 3⅛" (79 mm) high. Bretby Art Pottery, more properly known as Tooth & Co. Ltd., was started in 1883 by Henry Tooth and William Ault. Ault left after four years to set up his own pottery at Swadlincote. The company produced both inexpensive pressed wares and more costly thrown art pottery. Bretby stayed in the hands of the Tooth family until 1933, and after the second World War became known as Tooth and Company Limited Bretby Art Pottery. Marks include the familiar rising sun over the name BRETBY, a stylized HT for Henry Tooth, and the brand names Clanta and Clanta Ware.